The drawing I had created for my Bestie of her Great Dane, Maggie, sparked some requests for commissions. 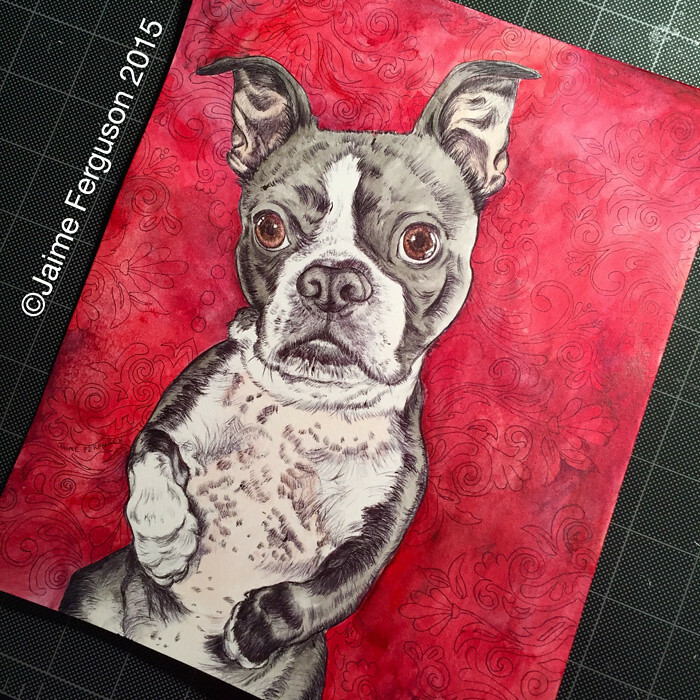 My hairdresser, Jessi (who is amazing) asked if I would do a portrait of her beloved Boston Terrier, Caesar. She had dozens of adorable pictures of him for me to work from, but ultimately we went with the image below for the 8″ x 10″ piece. With as much variation that was going on with his skin and fur, I was a little worried I wouldn’t be able to express which part of the fur was black or not. As soon as I started penciling, I decided to be as detailed as possible so it wouldn’t take me as long to ink. Think of sketching or drawing details as becoming the map to follow to the treasure. 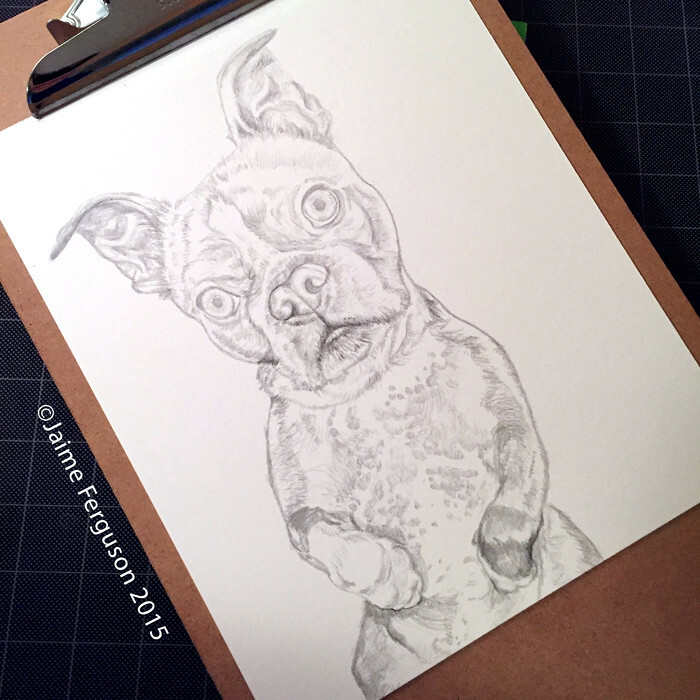 Work in progress of Caesar the Boston Terrier. Once I finished the penciling, I could tell Caesar was going to be more detailed than the Maggie portrait. Detail of work in progress. 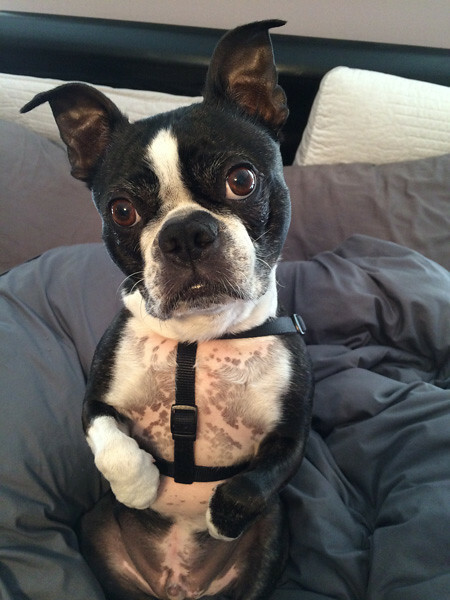 Caesar is a Boston Terrier. In the past, I would tend to ink drawings with Micron or Prismacolor fine line markers, but the variation I am able to get with a ballpoint pen has really made me exclusively use ballpoint this year. The line work can go from really soft and light to a hard, dark line. The only drawback to a ballpoint is the fact it likes to spit ink onto the paper. I try to work with it when it does happen, but I am always nervous about the possibility of it ruining a piece. Work in progress. 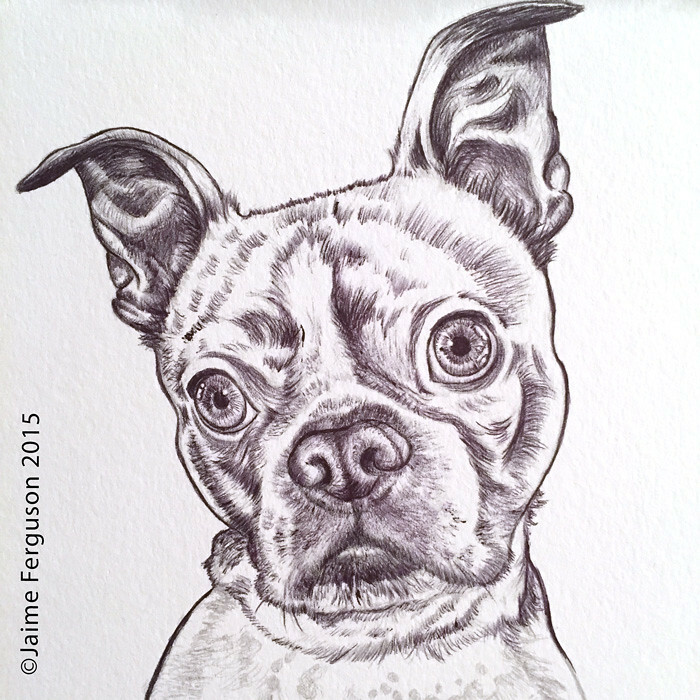 The entirely inked piece of Caesar the Boston Terrier. Since my doodles or patterned backgrounds have been a part of my work this year, I asked Jessi what kind of pattern she wanted behind Caesar. I find it makes it more personal to your customer when they can feel connected with everything in your art. She had mentioned she really loved Victorian style patterns, and I was able to find a pattern to draw behind the dog. Even though she wanted to keep it black, white, and red in the painting stage, I added a few other colors to bring his eyes to life and to show the difference in his skin and fur. The reds, purples, and blues mixed in the background really brought the piece to another level. It looked great as a strictly black and white piece, but I truly love the way it turned out in the end. 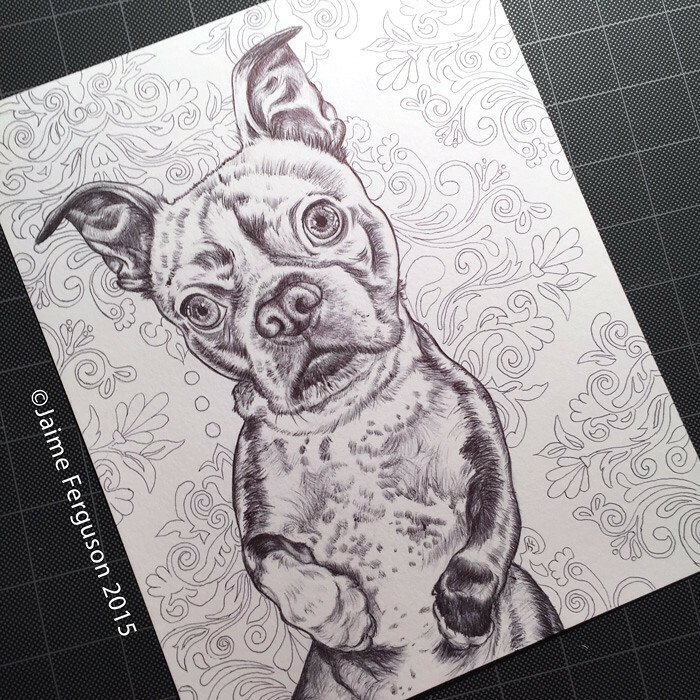 Final painted ballpoint drawing of Caesar the Boston Terrier.